Please call or write us to answer any questions. We are located on the beautiful Oregon coast. Note on Shipping: Sawmills are broken down into several pieces, some assembly is required. The sawmill, engine, track, and blades are all shipped with different shippers and arrival times will vary. The sawmills weigh over 1000 lbs. Please call for shipping quote, we do not ship outside the United States. Diameters of the sawmill are 42" by 16 foot 2" long logs. 42", Sawmill has a throat opening of 36". Unleaded gasoline engine on the 42" sawmills. Carriage moves easily on four roller bearing steel wheels. Bandsaw blade cuts swiftly and accurately on two roller bearing steel wheel guides. Track consists of two 10 foot pieces and comes with log and cant dogs. Blade measurements are 1 1/4" x .042 with 3/4" pitch saw blade. Quick setting hand crank for lumber measuring and adjustment. Extra 10 foot sections of track, to cut any length of log. Bench saw grinder for sharpening saw blades. Extra log and cant dogs. About Us: We have been in business for about twenty-five years now. Our hours are Monday through Friday, 9:00 a.m. to 5:00 p.m. Weekend Demonstrations are also available please call for an appointment. 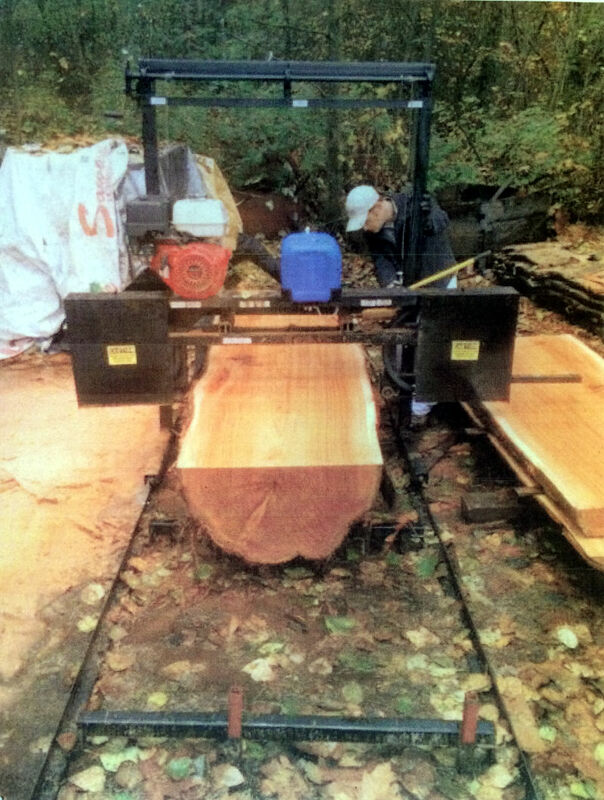 We have built about one thousand sawmills since we began in 1993. Our location is approximately 30 miles east of Coos Bay/North Bend, which is on the Oregon coast. Please see the map link for directions. Please call or write us to receive a free brochure or to answer any questions.